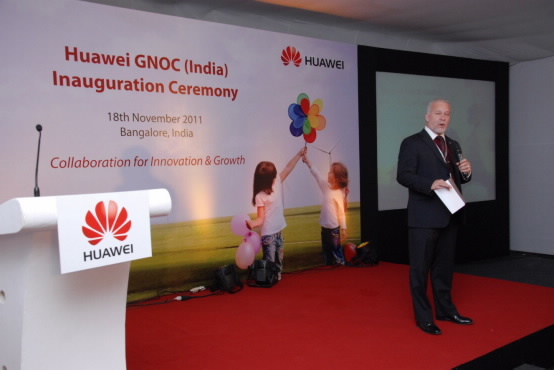 [Bangalore, India, 30 November , 2011]: Huawei, a leading global information and communications technology (ICT) solutions provider, announced the opening of a Global Network Operations Center (GNOC) in Bangalore, which complements Huawei's existing Network Operation Center (NOC) located in New Delhi. The GNOC will offer a wide range of managed services capabilities that will meet the current and future needs of Huawei's operator customers, enabling them to substantially improve their network quality, leverage network investment, and reduce operating costs. Referred to as the "Silicon Valley of India", Bangalore is the leading centre of technology and software development for the IT and telecommunication industry in the country. The Huawei research and development (R&D) centre, established in Bangalore elevenyears ago, will provide the GNOC with direct R&D expertise and access to new innovations and developments. "The opening of this Global Network Operations Center marks the beginning of a new chapter for Huawei in India," said Dr. Leroy Garwood Blimegger Jr., vice president of Huawei GTS. "It demonstrates Huawei's commitment to India - a country that is becoming an increasingly important center of global excellence for the managed services industry." Benefitting from Huawei's global capabilities, the GNOC will provide a range of professional services such as network design, customer support, network optimization, systems integration, and network transformation. It will play a pivotal role in Huawei's aim to provide both in-country and off-shore delivery as part of its global managed services platform. The GNOC will also enable Huawei to transfer operations to its team more efficiently, thus allowing customers to focus more closely on their core business. This GNOC is the latest addition to Huawei's family of global business platforms that span Asia, Europe, Africa and Latin America. Huawei is the world's fastest growing managed services provider, with more than 230 global contracts. Huawei has over 22,000 employees working in services and managing networks in over 100 countries and serving more than one third of the world's population. Dr. Leroy Garwood Blimegger Jr., Vice-President of Huawei GTS, speaking at the inauguration ceremony.